Menopause has four stages: Premenopause, Perimenopause, Menopause, and Postmenopause. Each of these stages is characterized by their own set of symptoms and changes in body. Each woman experiences each of these stages differently, and for different lengths of time. Most of the guidelines for when symptoms will manifest and how severe are just that: guidelines. 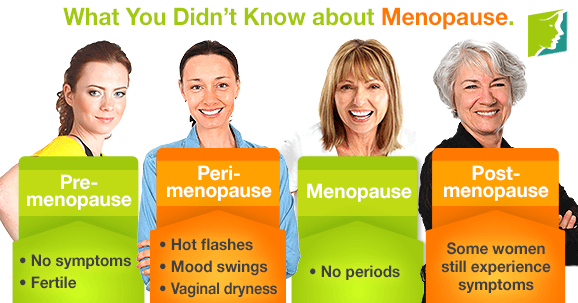 Each woman is different and will have a different experience with menopausal symptoms. Premenopause is the stage of your life before the menopause transition has begun. You should be experiencing no menopause symptoms, fertile, and having regular menstrual cycles. This stage should last at least until your late thirties. What to Expect during Perimenopause? This is the part of the transition when you notice changes in your body and menopause symptoms will begin to reveal themselves. Hot flashes, weight gain around the mid-section, and mood swings are a few of the symptoms that will begin to manifest. Irregular periods are a sign that your estrogen and progesterone levels are fluctuating and hormonal balance becomes one of the key ways to relieve symptoms. You're considered menopausal when more than a year has passed since your last period and you're no longer able to become pregnant. Symptoms include, but are not limited to, thinning hair, weight gain, loss of libido, depression, incontinence, brittle nails, burning tongue, and itchy skin. If you experience abnormal hair growth or a lowered voice, ask your doctor about testosterone imbalance. Unfortunately, postmenopause doesn't necessarily guarantee your symptoms will vanish into thin air. Hormonal imbalances may be a part of your life for a long while, as it can take a long time for your body to fully adjust to its now hormone levels. Some women in their 70s report still suffering from symptoms. Alternatively, some women never experience any at all. If you are nearing the age of menopause or are currently experiencing symptoms, it's time to have a conversation with your doctor. There are varying treatment options, but symptoms subside with a healthy diet and regular exercise. If this is insufficient, herbal remedies and other alternative treatments like acupuncture are available. In more severe cases, medial intervention is possible. To find out more about the treatments available for menopausal symptoms, follow this link.